Railings for Decks in Marblehead, Boston & North Shore MA | Boston Porch & Deck Co.
Deck railings are one of the most important and visible features of your new deck. Therefore, it is important to choose the right railing that complements your deck’s material and the design for your home. We have a variety of colors, designs and accessories for you to choose from, and will help you choose the best railing to compliment both your deck and home. Most of our railing systems are built from composite or metal materials, both of which are very dura ble materials. Because railings are such a critical component to your deck, we take the time to discuss with you which designs and colors will work best. 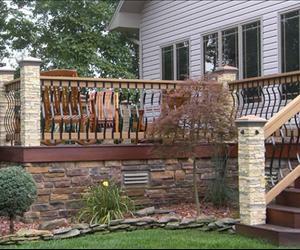 For a free estimate on a railing installation or repair project, please feel free to give us a call at 781-584-8060.